Heavenly Father, I praise and glorify You, my God. I thank You for the promises and hope of Your word. Thank you that You promised to walk with me. Lord, I thank You that You will guide and teach me, as I let Your word and truth turn my heart from sin and renew my mind in goodness and truthfulness. 2 Corinthians 6:16 I will also walk among you and be your God, and you shall be My people. 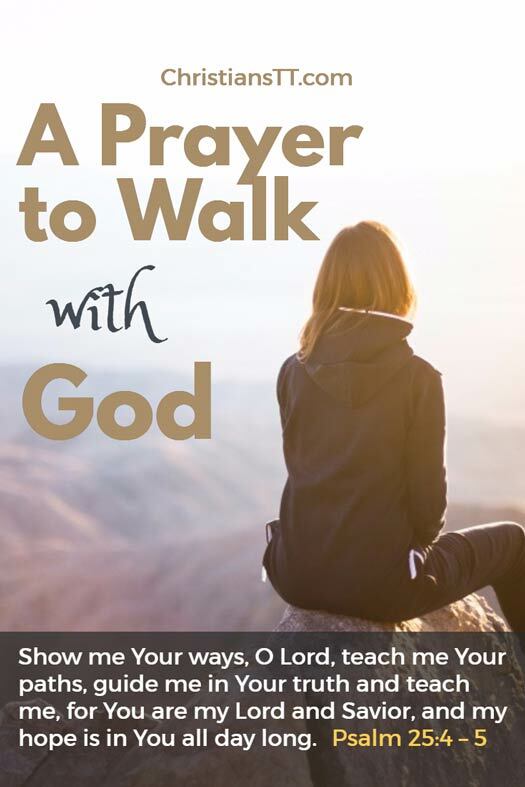 Psalm 25:4 – 5 Show me Your ways, O Lord, teach me Your paths, guide me in Your truth and teach me, for You are my Lord and Savior, and my hope is in You all day long. Lord Jesus Christ, I come in need to walk in the hope that only You can give. My way is unclear. The path is sometimes filled with twists and turns and confusion. Show me Your ways, Lord. Show me how You would walk in these places. Teach me Your paths of grace, mercy, integrity and love. Help me to grasp Your ways so I can walk securely in them, even in the valley of darkness. Lord, I need to know Your perspective. Help me, Lord Jesus, to focus on Your ways. Psalm 119 : 15 I will meditate on Your precepts and have respect to Your ways. Guide me in Your truth, Lord Jesus. Without Your Word active in my heart and mind, I cannot know Your truth. Help me make time to read the Word. Help me to take time to meditate on your Word and let it penetrate into my heart. Lord, Your Word will guide me as a beacon and a light. Forgive me when I have left it on the shelf, collecting dust. Forgive me if the cares of the world have simply come in my way where I grabbed a verse and run off for the day, forgetting what I read. Help me, Lord I pray. Take away everything that hinders me, while I spend quiet, quality time in Your word and prepare myself in my walk with God. Psalms 18:1-2 I love you, Lord, my Strength. The Lord is my Rock, my Fortress and my Deliverer, my God is my Rock, in whom I take refuge, my shield and the horn of my Salvation, my Stronghold. Oh Lord Jesus, You are my Savior, my Rescuer and Redeemer. You alone are the One who restores and renews my spirit and brings meaning to my life. You bless me as I deserved in my daily toil. May my heart overflow with thanksgiving to You for Your hand in my life. Lord, I will put my hope in You today, all day long. Remind me, through Your Holy Spirit, to look to You for guidance. Call me into Your quiet presence to think on Your truths and precepts. May I not be distracted by the world. Thank you that You give the hope and help and peace I need. Thank you that You never cease to call me to Yourself. Help me to respond afresh to Your presence in my life as I seek You daily in prayer and meditation. Help me, Lord Jesus Christ, walk with You, my Lord and God, Amen!